The Sims Medieval shakes up the series' familiar formula, incorporating elements of the strategy and role-playing genres like a knight putting on armor. Electronic Arts seems to have developed a habit of shaking up Will Wright's former franchises, transforming the evolution-based sim Spore into the action RPG Darkspore and, today, announcing a new entry in the long-running Sims franchise that will take the series sightly out of its comfort zone. The Sims Medieval takes the familiar style of micromanagement that fans love and infuses it with equal parts Civilization and Dragon Age, tasking players with creating heroes, taking on quests, controlling a kingdom, and conquering their neighbors. Like in previous Sims games, you take on the role of the omnipotent deity, manipulating every aspect of day-to-day life. You will design a number of "hero" characters, customizing their traits and flaws, then set them loose to defend the kingdom. Hero characters will take on different roles, including kings, queens, wizards, knights, blacksmiths, and bards. 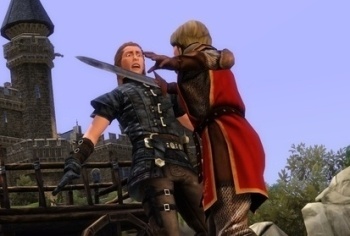 While these "hero" Sims will take on various quests - crafting a legendary sword or arranging a royal wedding, for example - you will still be responsible for the type of micromanagement that the series is known for. Between quests, your Sims will tend to the sick, trade for goods, have babies, and forge weapons. Presumably, you will also have to make sure that they make it to the chamber pot on time. The Sims Medieval adds a city-building element to the mix. In addition to caring for your Sims, you must look after your kingdom. Over time, your city will grow or shrink through a series of internal choices or through wars with neighboring territories. Whether this is through StarCraft-style troop management or Sim City-like choice toggling is not yet known, but there are several interesting possibilities for combining The Sims with the strategy genre. The Sims Medieval is being developed by The Sims Studio and will hit the PC and Mac sometime next Spring.